Nonetheless, I think there is something to be said for keeping up with the blog, as it seems to have a decent number of followers now, and I do like seeing the finished product up on my laptop! I was so busy raving about one of the products that follows to a friend this week, that it seemed the perfect excuse to do a blog post about it, together with some other products that have been my essentials this summer. First up is the ‘Mythic Oil’ from ‘L’Oreal’ which I was sent with a Glossy Box a while back (I unsubscribed a while ago, but that’s another story). It seems to be doing a decent job of taming my slightly unruly wavy hair, and so it is in fact, the only thing that stopping me from going back to a much shorter haircut. I wouldn’t say it’s failsafe. It’s just doing a decent job. I apply it to both wet (towel dried) and dry hair (after blow drying and straightening) and it just tames it sufficently to be manageable. Next up is Liz Earle’s ‘Superskin Concentrate’ (the one I was raving about to friend). All I will say about this is I love, love, love it. It claims to ‘plump and smooth’ and it supposed to be used in the evenings after cleansing, which is exactly what I’m doing. With a mixture of rosehip, argan and neroli oil, which all combine to make for the most heady of aromas, the idea is to rub it together in your hands and inhale before massaging it into your face. Fantastic. Just the most amazing treat. The 28ml bottle in the picture below costs £40. Yes, I know not massively cheap, but take my word for this: it’s money well spent! Buy it. Now. That’s all! 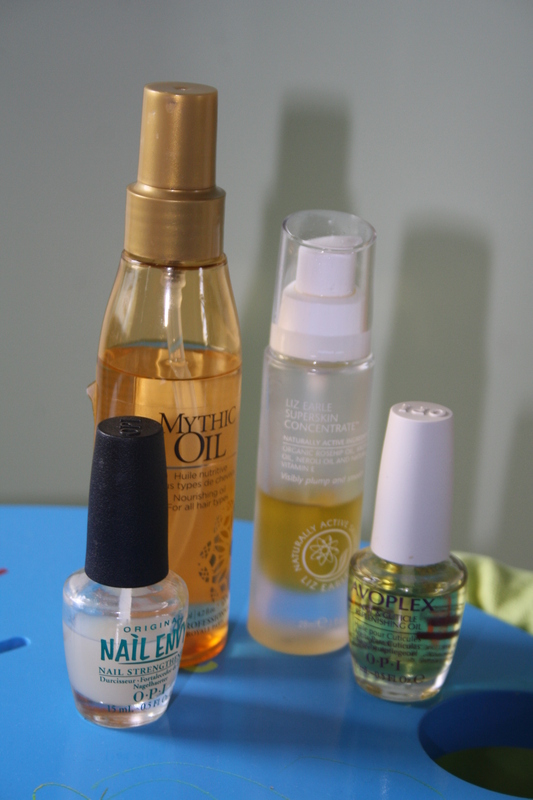 The last products are both part of my post-Shellac/gel nail recuperation routine, which has really brought my lacklustre, brittle, nails into their own. OPI’s ‘Nail Envy’ is a well known nail strengthener, and in my opinion, the best of its kind on the market. It does exactly what it says on the bottle. You apply two layers initially and then re-apply every few days. If you combine this with Avoplex’s ‘Nail and Cuticle Oil’ and apply them both religiously, you are pretty much going to have nails that are as hard as…umm… nails!